The aim of Weather is to act as a bridge between the interests of those having a professional and a general interest in the weather, as well as between meteorologists and others working in related sciences such as climatology, hydrology and geography. Articles and regular features are written for a wide range of readers, from professional meteorologists to amateur weather observers. While technical language and mathematical content are kept to a minimum, Weather also seeks to inform and to give readers an opportunity to update their subject knowledge. 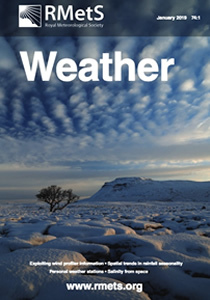 Photographs of weather events are an important feature of the journal and the Weather Image feature provides an opportunity to analyse a satellite image or photograph. Weather Log is a summary of the weather of each month by means of meteorological data and weather maps. Weather is the 'house journal' of the Society and therefore also provides members with Society news, meeting and conference reports, a Readers' Forum series and occasional Viewpoint articles. As a member of the Society, you will receive Weather as part of your membership package, either as a printed copy or online.